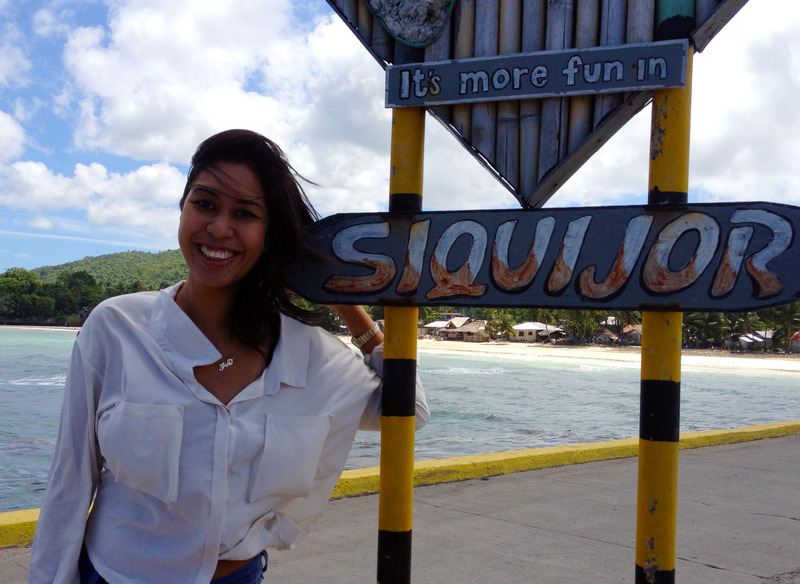 Siquijor is a gem of a find, one of the places that really makes me want to know my home country better. It blew my mind thinking how an island as accessible and gorgeous as this one could stay under the radar for so long. As I looked around to see my co-passengers at the ferry from Dumaguete, almost more than half were actually foreigners, aside from the few locals making their way home. 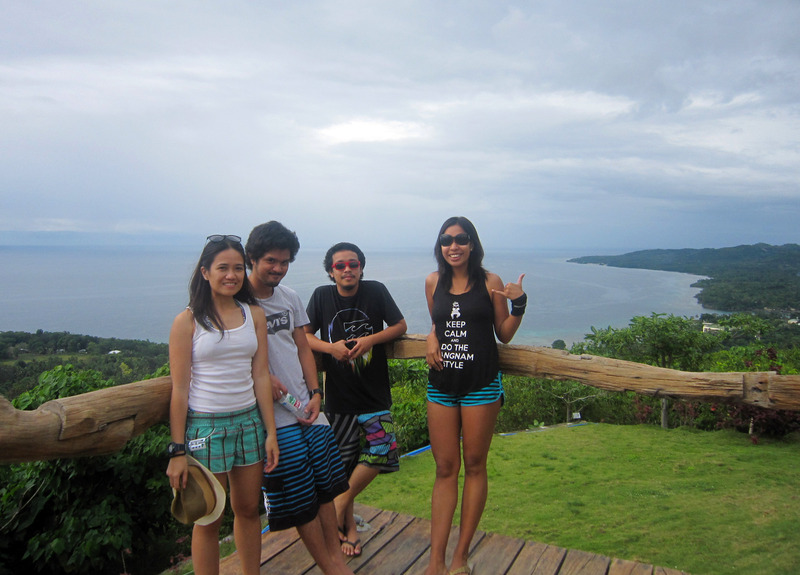 And then there were us, a gang of giddy local backpackers — not a usual sighting, I guess. Maybe it’s because usually when Siquijor is mentioned among Filipinos, it is not without the quips about black magic and creatures of the night. 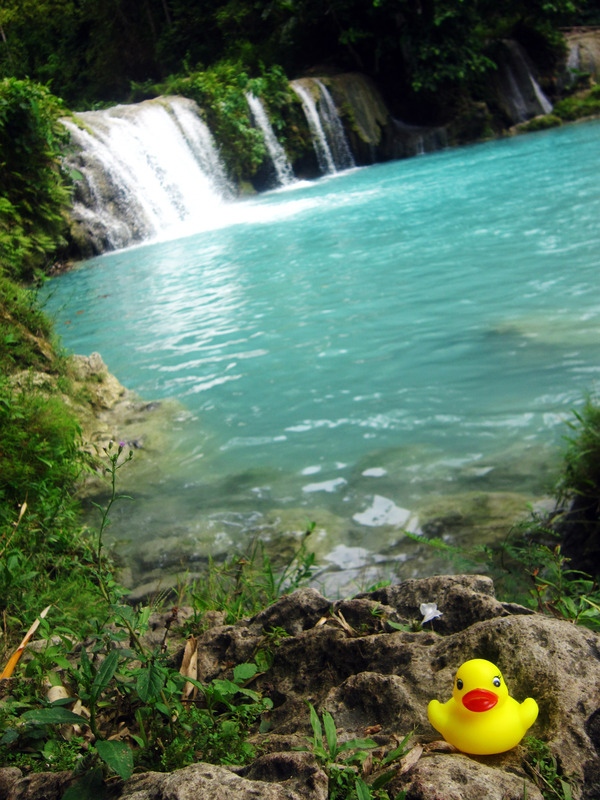 It’s such a shame though, because yes, Siquijor for me was bewitching, but all for reasons right and good. When our ferry docked at Larena port, the white sand and sparkling beryl waves reeled me in instantly. A few paces away was the St. Francis Assisi Church, where I gushed in gratitude to The One Above for the path that led me to this haven. We then caught a tricycle ride (P500 for all four of us) to take us to Salagdoong Beach Resort at the town of Maria at the other side of the island. Siquijor is blessed with a long magnificient white coast; the coastal road that grazed along it was impressive too, as we hardly had to go on rough roads. It boasted of the efficiency of the local government, which as a Filipino, you’ll never take for granted. 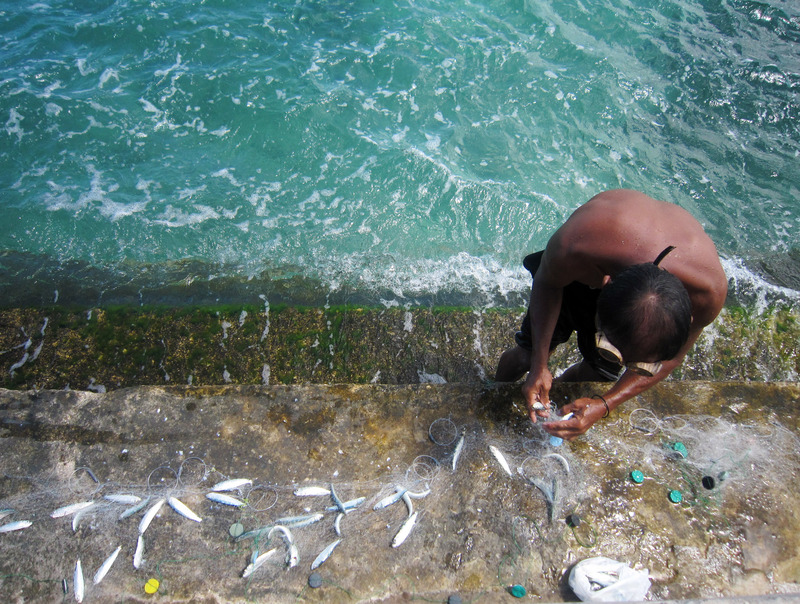 The water at the pier was so clean, you could swim and get a decent catch of fish in it. Around half an hour later, we got off the main road and turned left into what looked like a forest enclave. We were swallowed by the trees, and at the path’s end was finally Salagdoong Beach Resort. As a government-owned hotel, not only was it affordable, the resort also showed off one of Siquijor’s best assets: Salagdoong Beach. Easy Sunday merriment filled the air, as families and groups of friends soaked in the sun and waded in the water. We settled in and snoozed off a bit, before capping off the day with a Grilling Fish 101 crash course from the boys. 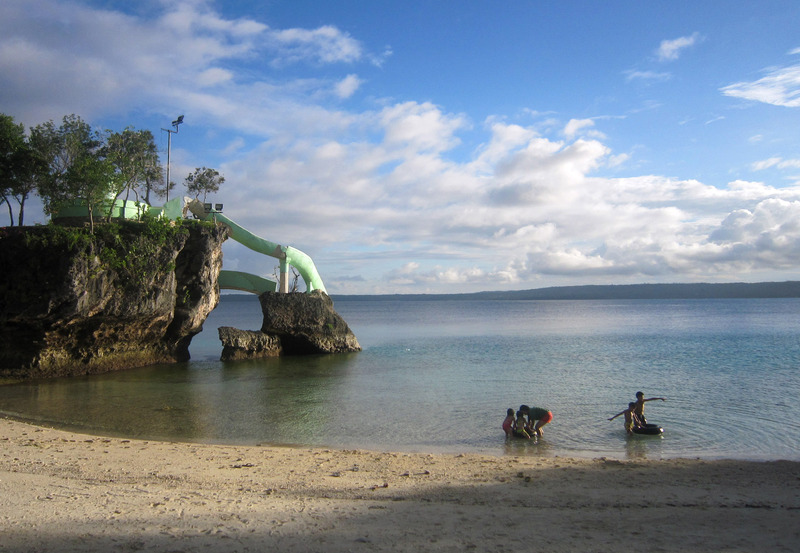 Care to make a memorable splash at Salagdoong Beach? You can dive off the platforms fixed high on the cliffs overlooking the water. Morning came, and we arranged for a van to take us for a tour around the island. We stopped at two more big churches (a lot of them seemed to dot the place), before scooting off to Cambugahay Falls at Lazi. Reggae digs? 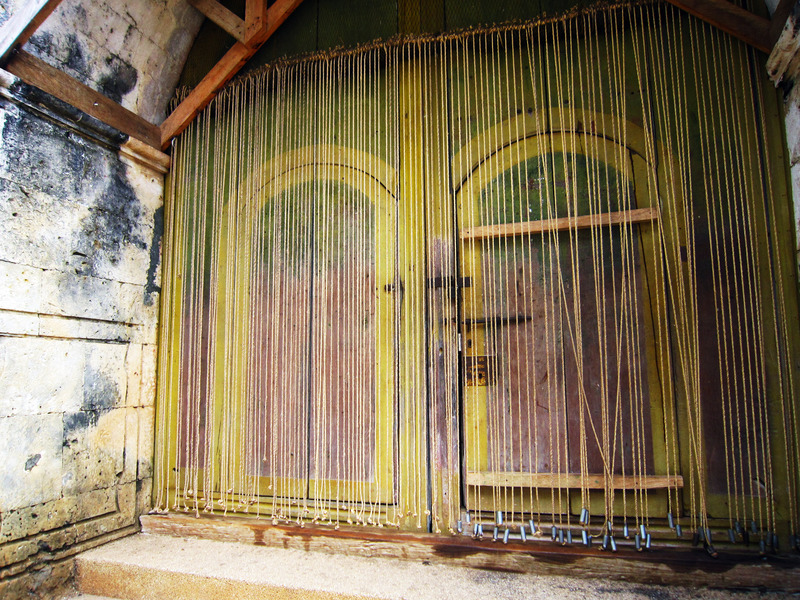 No, these are the doors to the San Isidro Labrador Church in the town of Lazi, right across the San Isidro Convent, another national historical treasure. We parked by the side of the road and went down 135 steps of stone stairs (again, very nicely made by the local government). And lo and behold, at its end, paradise awaited. By then, I knew I was in love. How can one not go crazy at the sight of multi-tiered waterfalls, all yours for the taking? (again, if you didn’t catch it: MULTI-TIERED WATERFALLS!) My mind was sent to a frenzy, trying to brainstorm on how I can save up money to buy a piece of land in Siquijor; all I knew was that I wanted this sanctuary to be always within reach! I could already imagine the perfect day — me taking a motorbike to the falls, and then spending the whole day hiking and swimming along the stream, or jumping from the top of the falls. If you ask nicely, the locals can set-up a long, thick vine (think Tarzan-strength) for you to try your hand at swinging into the deep. This was the part I was most excited about, honestly, as I’ve never tried a vine-swing before. Alas, I wasn’t really any good at it, but just jumping off into some of the clearest water I’ve seen was enough to lift my spirits. I know pasteurized fresh milk was the last thing I expected to remember Siquijor for, but it was surely a good find, one I dare say is a must-not-miss. 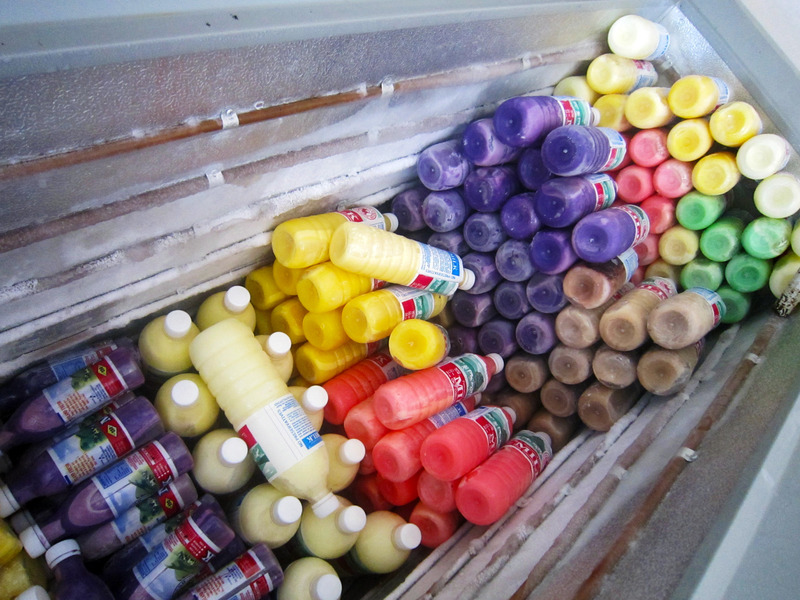 I regretted just getting the chocolate variety; you can get flavors like ube, mango, pandan and melon too. 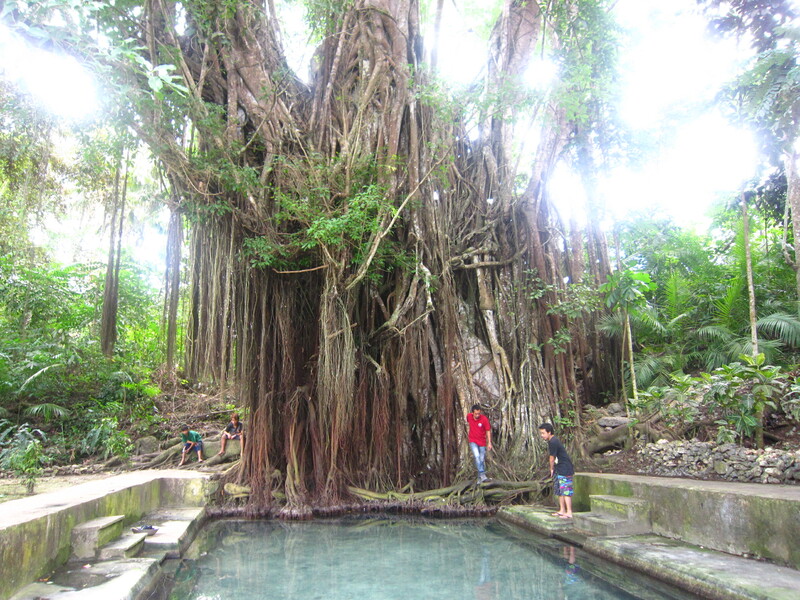 If its age is not enough to impress you, there is also a spring on the base of the tree, which flows onto a man-made pool / fish spa. Yes, you can wade on it while enjoying being groomed by Mother Nature. 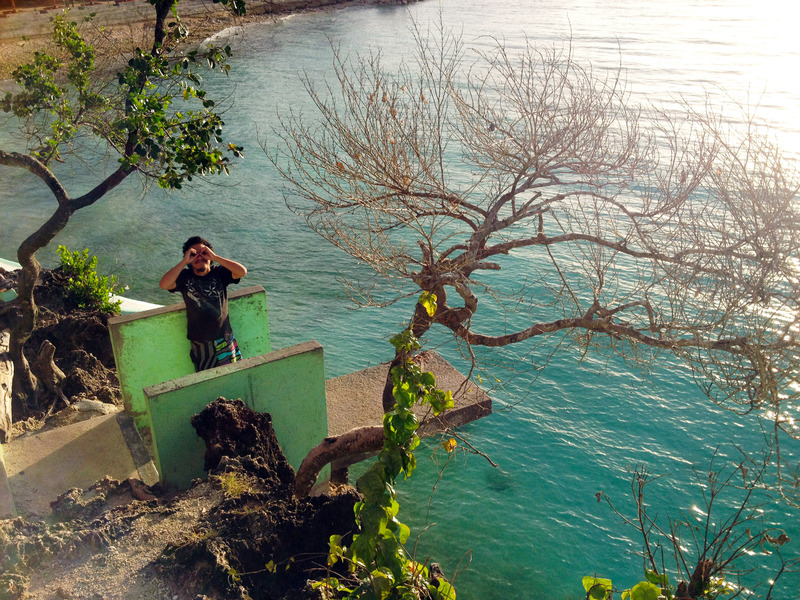 Okay, technically, this is outside of Siquijor, but most likely you’ll be making a stop at Dumaguete anyway. This gem is just a short distance from the port; hail a tricycle and tell them “Lab-as Restaurant” and they’ll know where to go. “Lab-as” means fresh in the local dialect, and they weren’t lying. The resto has a fine dining feel, but offers very reasonable prices for quality fare (for instance, a plate of baked oysters go for PHP 145 or ~USD 3.50). Everything we ordered tasted so good, that we ordered a reprise of almost everything we had. 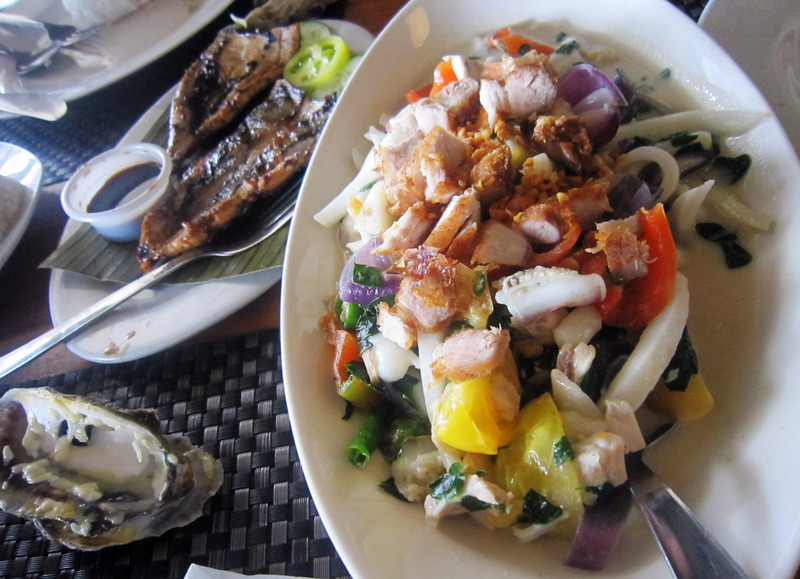 Try the kinilaw, grilled bangus (milkfish), Dumaguete Express, and baked oysters. Happy hearts + happy tummies = another perfect Philippine getaway. Catch a plane to Dumaguete Airport (DGT) and then hail a ride to the Dumaguete City Port (PHP 200 by taxi, PHP 180 by tricycle). 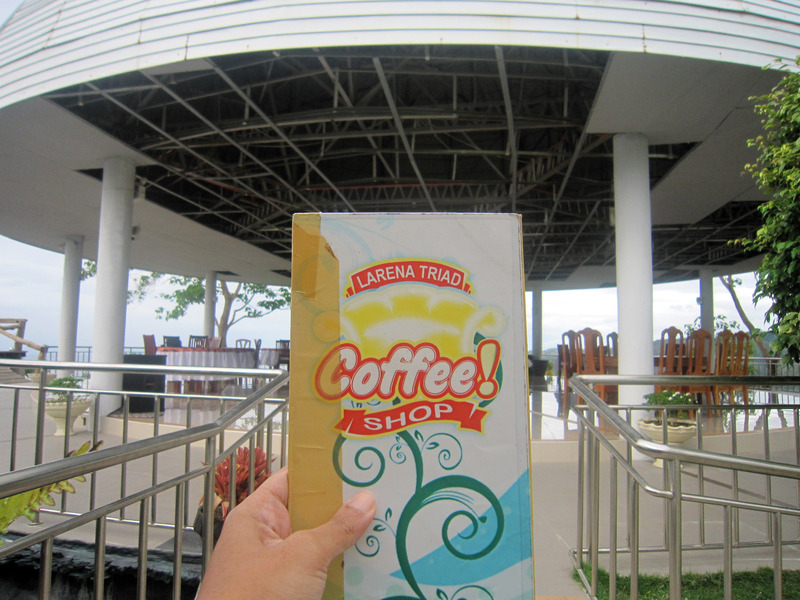 At the port, catch the ferry going to Larena Port in Siquijor island. Here’s a good resource for the ferry schedules: http://www.siquijor.gov.ph/ferry%20Sched.pdf.